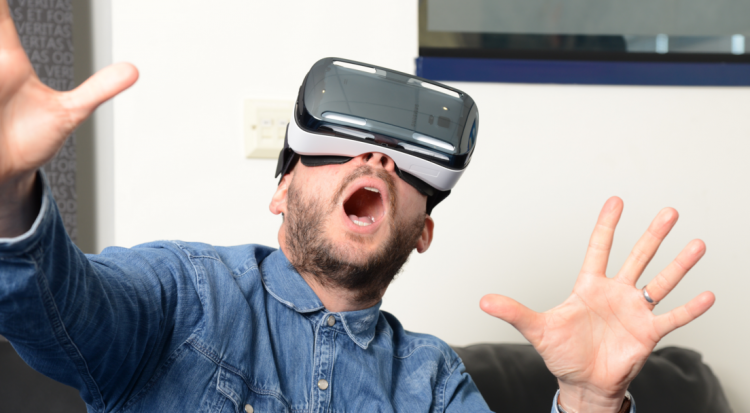 Editor’s Note: With so many new people getting VR headsets this holiday season we thought it would be valuable to republish this listicle from 2017 focused on ways to overcome VR motion sickness. If you’re experiencing severe effects the best thing you can do is take off the headset and stop right away, but there are some other steps to take that might help you grow more accustomed to the immersive realm more quickly. Motion sickness: it’s far from the flashiest aspect of VR, but it’s a real problem for some people when they put on a headset and enter a virtual world. VR motion sickness happens when your eyes tell your brain you’re moving around in a VR environment, but your body feels like it’s sitting in a chair or standing still. If you’re prone to the problem, these conflicting inputs cause you to feel miserable. Specifically, you might experience sensations like nausea, dizziness, headaches, sweating, excessive salivating, or all of the above. Even worse, these symptoms can continue for hours after you take off the headset and compound together. Even if you’ve experienced VR motion sickness first-hand, don’t give up hope just yet. It’s possible to mitigate and even overcome VR-induced motion sickness altogether. We’ve already gone over a few tips that developers can use to limit reactions here, so we’ve included some advice specifically for consumers below. Next time you’re having issues, give some of these a try. Let’s say you’ve had a bad experience playing a VR game. You tried it, and the moment you started moving around in the virtual world, your stomach lurched and your head started to spin. You might not be inclined to venture back into VR, but if you give up now, you’ll be depriving yourself of some truly amazing experiences. It’s actually possible to overcome VR motion sickness without using any crazy tricks at all. You can do it simply by taking it slow. If a game makes you feel queasy, start out by limiting your play sessions to just a few minutes at a time. When you start feeling uncomfortable, shut your eyes, breathe deeply, and take a short break before trying again. If you gradually increase the time you spend in those games, there’s a good chance you’ll overcome the discomfort in just a few days’ time. Before long, you’ll be cruising around imaginary worlds like a pro. For many people, getting their “VR legs” just takes patience and practice. This one sounds bizarre, but at least one study suggests it’s rooted in scientific fact. According to the report, you may be able to overcome VR motion sickness simply by having someone tell you you’re going to be fine. The study focused on naval cadets who, prior to boarding their assigned vessel, were told they were unlikely to suffer from seasickness, regardless of whether it was true. The post 7 Things You Can Do to Overcome VR Motion Sickness appeared first on UploadVR. FeelReal Smells Success as it Takes Another Shot at Kickstarter Success The crowd-funding campaign will be launching soon. Last month, Facebook added basic support for HTC Vive to the Oculus Unity Integration. In the December release the company expanded that support, as well as reducing the GPU cost of Oculus Rift support. The Rift’s GPU performance improvement in Unity apps has been achieved by making the occlusion mesh culling “more aggressive”. This should free up some GPU time for rendering. However, it comes at the cost of making the editor preview smaller. The latest feature of Oculus Integration to support the HTC Vive (and in theory any SteamVR headet) is OVROverlay. This is the Oculus compositor layers system, sometimes called “TimeWarp layers”. On HTC Vive these layers will be passed to SteamVR’s compositor. CTO John Carmack often espouses the importance of rendering UI & text via TimeWarp layers. He went as far as calling it “the biggest” tip for sharp text in VR. OVROverlay is the way to do this in Unity. As well as adding support for OVROverlay to HTC Vive, this update also adds a new sample scene & tutorial for the feature. Carmack has often noted in his public talks that many developers still don’t utilize this, so the new sample scene should be a great help. If you’re a developer of a VR app that doesn’t use compositor layers for your text, we recommend checking it out. VR headsets are low enough resolution as it is, so you should use all the software tricks available. The final addition of 1.32 is the Oculus Profiler Panel, a popup window for Unity specifically made for profiling VR performance. It works on Rift apps locally and from Oculus Go over USB. The release notes state that the feature doesn’t work properly on Gear VR yet. This is a welcome addition and should make finding the cause of performance issues easier. The post Latest Oculus Unity Integration Expands HTC Vive Support, Improves Rift GPU Performance appeared first on UploadVR. The post Made-For-VR ‘FlyInside’ Is What VR Flight Simulation Needs appeared first on UploadVR. Steam’s Top Selling VR Titles for 2018 Include Beat Saber, Arizona Sunshine and Pavlov The best selling Steam titles of 2018 have been released. Valve released a list of the 100 top selling VR games on Steam in 2018. More than 1,000 titles released on Steam this year with VR support, according to Bellevue, Washington-based Valve Corporation. The vast majority of the releases are VR-only but the only completely new 2018 VR release to reach the top “platinum” tier of gross revenue on Steam was Beat Saber — which sold more than 100,000 copies in its first month of availability on PC this year. We’ve linked to our reviews below for most of the titles in the platinum, gold and silver tiers. Other top selling VR titles at the platinum level include Fallout 4, Gorn, Orbus, H3VR, Pavlov, Skyrim (which released on PC in 2018 but appeared on PSVR in 2017), Superhot, Job Simulator, Onward, Arizona Sunshine and one title intended for adults only. Gold tier of top grossing VR content on Steam in 2018. The gold tier of titles includes Budget Cuts, Raw Data, Virtual Desktop, Stand Out, Tilt Brush, Sprint Vector, Sairento, Zero Caliber, I Expect You To Die, Space Pirate Trainer and Doom VFR. The silver tier includes two Serious Sam games as well as OVR, In Death, Moss, Box VR, Fruit Ninja, L.A. Noire: The VR Case Files, Richie’s Plank Experience, Creed, Dead Effect 2, Blade & Sorcery, VTOL, Audioshield and Duck Season. Silver tier of top grossing VR content on Steam in 2018. You can check out the 2016 and 2017 lists as well, with a lot of titles on 2018’s list also represented in previous years. The full list on Steam also includes 60 games at the bronze tier as well as a new section this year that lists top releases of 2018. Top VR releases of 2018 on Steam. The post Valve Reveals 100 Best Selling Steam VR Games Of 2018 appeared first on UploadVR. The post PSVR 2019: PlayStation Owned VR In 2018, Can Sony Stay Ahead In 2019? appeared first on UploadVR. The Best Google Cardboard Games of 2018 These are VRFocus' favourite videogames from the last 12 months. The post Therapists Using VR To Treat Mental Health Issues appeared first on VRScout. The post VR & AR 2018: A Year In Review appeared first on VRScout. The post UploadVR’s Best Of 2018 VR Award Nominees appeared first on UploadVR. The Best HTC Vive Games of 2018 These are VRFocus' favourite videogames from the last 12 months. The secrecy is extreme surrounding Valve Corporation in Bellevue, Washington. Leaks are rare because the privately held game-maker is composed of only a few hundred people. This group is also the operator of Steam, which launched in the early 2000s and up until very recently enjoyed a 30 percent cut of every game sold through its PC games marketplace. This ballooning revenue source over the last decade led some to estimate Valve makes the most profit per employee of any company. Most people don’t know that Valve’s engineers are also the ones responsible for the “lighthouse” tracking technology that was key to HTC Vive’s first-to-market PC VR advantage when it launched in 2016. Tracked hand controls and room-scale movement freedom were essentially exclusive to Vive developers and customers for most of 2016. It wasn’t until December of that year when Facebook delivered a comparable experience with Oculus Rift. In 2017, Microsoft partnered with PC manufacturers and built a line of low-cost Windows-powered VR headsets. While it served both Microsoft and Valve to make these Windows-based headsets work with Steam too, where does that leave HTC and its Vive headset if Valve builds its own? I’ll get back to HTC in a bit, but for now I want to focus on two of the leading drivers of PC VR: Facebook and Valve. While Valve leaks are rare, there was one recently showing a head-mounted display featuring a circuit board with the company name on it. This suggests Valve is developing its own head-mounted display which would likely be equipped with the second generation of its SteamVR Tracking technology. A Valve HMD with a wider field of view and hand-strapped Knuckles controllers, as well as upgraded room-scale tracking, sounds like a recipe for an incredible second generation PC VR development kit. Such a kit would seem to improve immersion in every way relevant to developers who are exploring what it means to build virtual worlds for people to explore, work or play inside. Critically, though, while such a headset might be perfect for inspiring developers it wouldn’t necessarily be what the VR market needs for significant expansion. To access a larger market, VR headsets need to lose the wired tether to the PC for convenience while also decreasing overall system cost. This is where Facebook is aiming with its $400 Oculus Quest releasing early next year, hoping that among its 50-plus launch titles there will be enough compelling content to convince millions the headset is the right time to buy in. The post Facebook and Valve Are On Diverging Paths In 2019 appeared first on UploadVR. Mash Your Opponents in Spuds Unearthed Next Month It'll launch into Early Access for PC VR headsets first. The Best PlayStation VR Games of 2018 The are VRFocus' favourite videogames from the last 12 months.